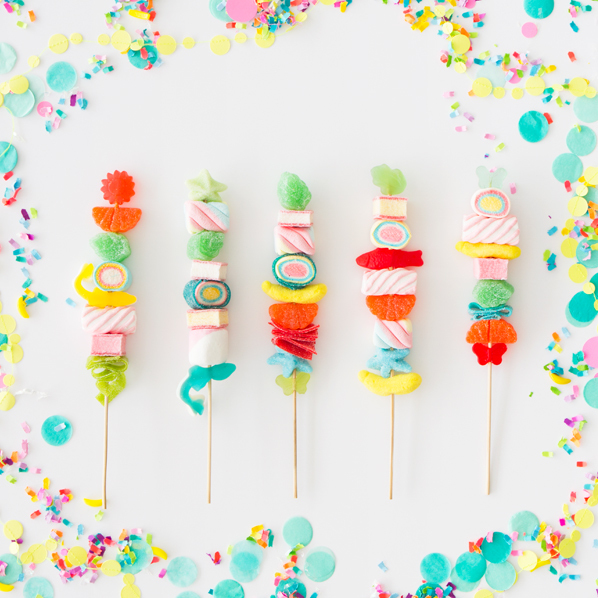 7 Tips to Make Perfect Candy Kabobs! 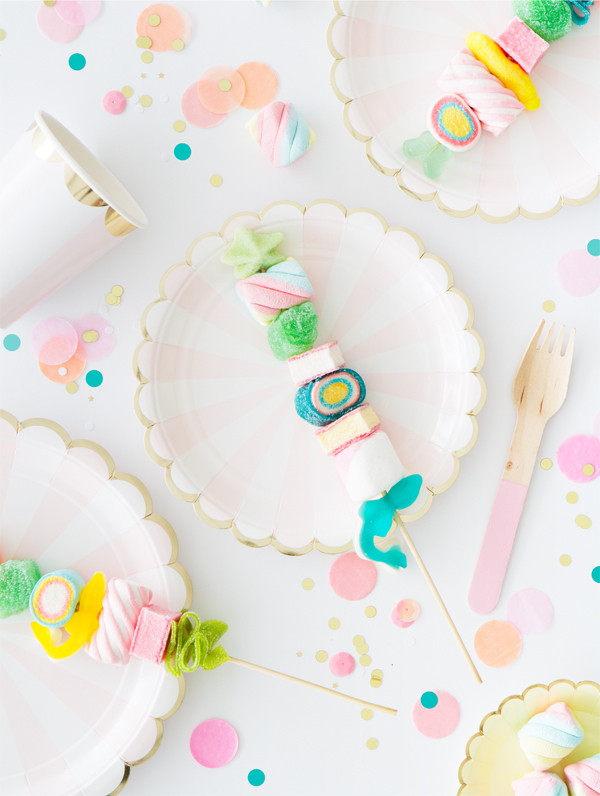 Is it just me or are candy kabobs kinda EVERYWHERE right now? At Oh Happy Day we decided to try our hand at them and were bummed to discover that they are harder than expected to get right! 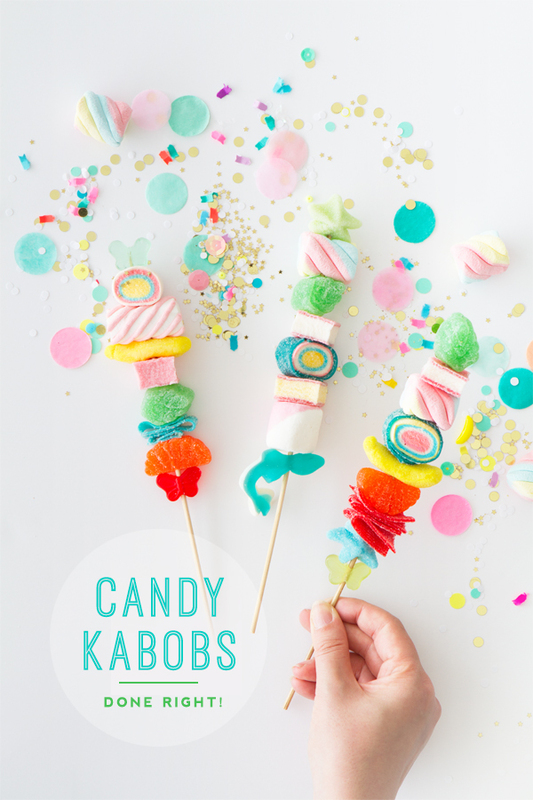 7 TIPS FOR GREAT CANDY KABOBS! First and foremost, soak the skewers in water and wipe dry before skewering! This helps the candies from sticking to the wood when they’re sliding on. 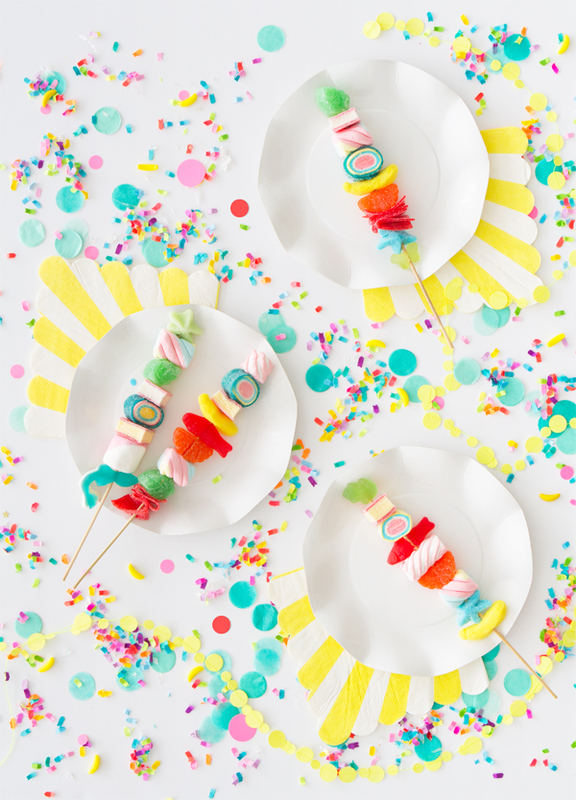 Skewers look the best when there’s a lot of variation in the color, texture, and type of candy. Try mixing some semi-translucent gummies (they look great when they catch the light!) with opaque candies — the variety adds a lot! Color is essential- we found that the most vibrant colored candy works best so ditch the dull colors and mix bright rainbow colors for maximum visual impact! Pay attention to form- make sure your column of colorful candies looks balanced from top to bottom. Lay out your candy designs before skewering them onto the stick, this will save you a lot of frustration if you want to change your mind! Pick thicker candies (larger than a 1/4 inch). Thinner ones tend to crumble when punctured. Try experimenting with the candy itself! 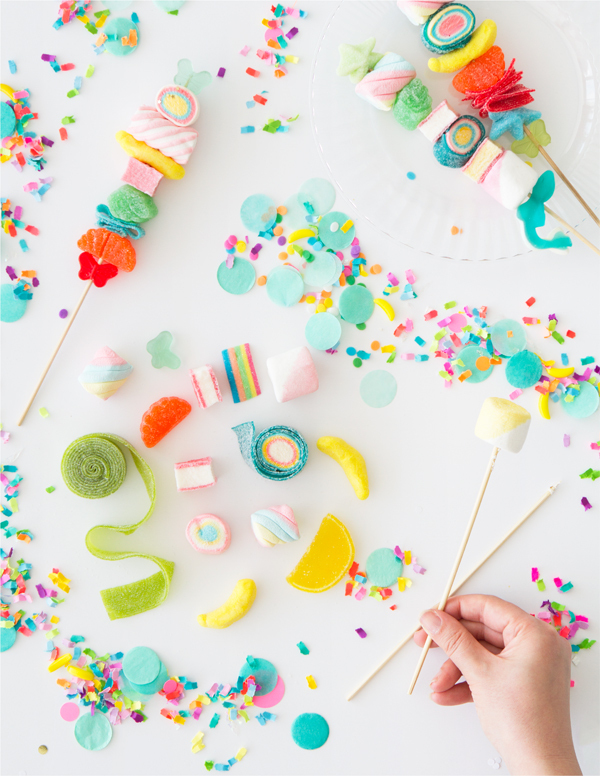 Color block your marshmallows by dipping them in colored food dye or dip marshmallows in sprinkles to add variety in texture (FYI- you can skip the use of corn syrup! Just dip the marshmallow in warm-hot water, shake off the excess liquid, and dip in your sprinkles. Marshmallows are already made of sugar, and the heat reactivates its stickiness). Finally, here are some great sources for candy! Nuts.com– We like Spearmint Leaves, Orange Slices, and Gummy Starfish. Amazon.com– Sugar Bananas, Butterflies, Awesome Blossoms Gummy Candy, Rainbow Ribbon Candy, Swedish Fish. You can also find a good selection of marshmallows. World Market– Gummy Candy Sushi, Luehder’s Marshmallows. These are adorable. What a great party idea! That’s my kind of kebab! What a sweet treat! I wish I liked candy more because these are so freaking pretty to look at!! Totally telling all my sweet-tooth friends. They look like tiny pieces of art to me, and I bet they taste heavenly as well! You saved me. I happened to be making these for my daughter’s birthday party the afternoon you posted this. I was singing your praises after my experience went so smoothly. No doubt I would have been cursing the experience if I didn’t have your tips!! Thank you! These definitely are the perfect candy for the children! Colourful and tasty, nice!